Our next destination was El Jem. 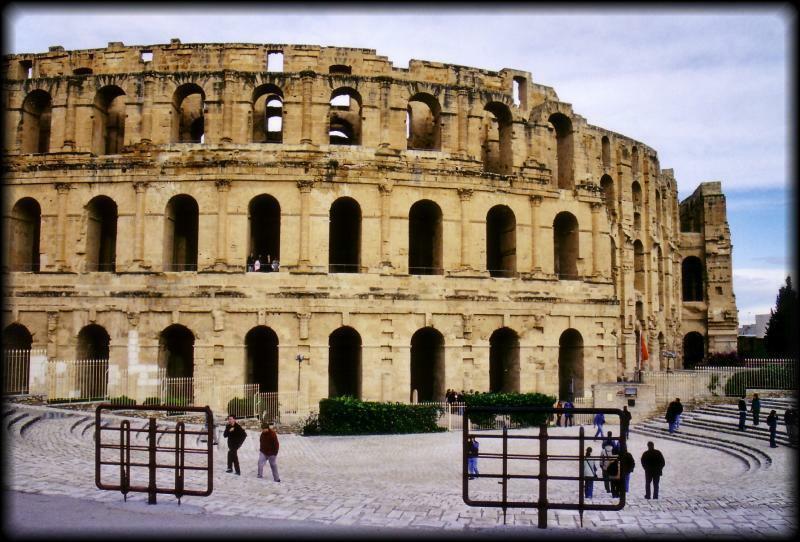 The only reason to go to El Jem is a magnificently preserved coliseum. It is directly off the train line heading south out of Tunis. We couldn’t decide whether it would be better to take the bus (which had more flexible times) or the train. We visited the tourist information office, but they were less than helpful – they could only provide train times, and had no idea of bus times. We ended up walking to the bus station to get the times,and ended up on the first train out the next morning. The train has a few different classes. We took “first class”, since it had guaranteed seats. It really wasn’t necessary as the train was empty. In the summer, first class offers air conditioning which would be more useful. There is also the “comfort” class which is the same as first class (only more expensive) but with wider seats. In El-Jem, the coliseum is a 5 minute walk from the train station. It’s impossible to miss, as it dominates over the town. The day we were there, it was extremely windy and cold. It was so windy, in fact, that it was very uncomfortable climbing up the different levels of the coliseum. The sand was blowing in our face, and the stairs at times were quite steep and didn’t always have railings. The natural comparison is the Coliseum in Rome, and it actually compares quite favorably. It is possible to explore everywhere, even underneath the main level in the tunnels where the gladiators and animals were kept. It was quite empty the day we were there, so this also added to the experience. Of course, given the weather, it wasn’t really a surprise that it was so empty! I am planning a birthday surprise for my husband next month. He is a big fan of Star Wars so I thought I wanted to take him and our 5 year old son there. I am thinking of taking a 3 nights 4 days package in Tunis (Le Diplomat hotel). Tour is included but I think it is just for one day and only within Tunis. Since we have very limited time and I am trying to take them to as many places that relate to Starwars (from your blog, it seems that Matmata and Tatoouine will be the places), I will really appreciate your recommendation. Is there one particular visitor site that we should not miss? We really enjoyed our time in Matmata. Although they filmed all over Tunisia, the Cantina was filmed at the Hotel Sidi Driss. In addition, the surrounding geography is where they filmed a lot of the Star Wars world of Tatooine. Getting there isn’t too difficult – the louage system is excellent. However, be warned that the standard of hotels is very low – we will comment about that in the Hotel Sidi Driss blog entry so other people can find it too. In our opinion, you do not need 3 days/4 nights in Tunis. We did enjoy the market and the Mosque – and the Bardo is a must-see if you like Roman mosaics – it has a huge number of them. Best of luck with your trip!